TORONTO, ONTARIO (May 15, 2013) – Pangolin Diamonds Corp. (TSX-V: PAN) (the “Company” or “Pangolin”) is pleased to announce it has discovered its first kimberlite at its 100% owned Tsabong North Project in Botswana. Core logging identified crater facies sediments and underlying reworked volcaniclastic kimberlite (“RVK”) breccias in drill hole “Magi-01/1”. Representative rock samples were submitted for independent whole rock analysis to Activation Laboratories Ltd., in Ancaster (Ontario). The results assisted in discriminating between the kimberlite crater facies sediments and the overlying Kalahari Formation. Crater facies sediments are present from a depth of 33.5 meters to 58.8 meters below which RVK breccia occurs to 76.3 meters. The crater facies sediments and RVK breccias intersected are consistent with the equivalent lithological units observed in the core of drill hole M1/50 from the M1 Kimberlite in the Tsabong Kimberlite Field which was drilled in 1981. The 45 mantle-derived indicator garnets, inclusive of some high pressure garnets previously announced on March 26, 2013, were liberated from a core sample in Magi-01/1 taken at a depth of 22 meters below the surface. A split of the available core will now be processed through a mini-Dense Media Separation Plant to recover any additional kimberlite indicator minerals, such as garnets, and/or macro diamonds from the kimberlite intersected section. Based on these positive results, two additional diamond drill holes intersecting at least 100 meters of kimberlite will be drilled on the Magi-01 kimberlite for kimberlite indicator mineral and microdiamond recovery. The Company has also elevated additional previously identified kimberlite targets in the project area to targets of high immediate interest with similar magnetic signatures to Magi-01/1. 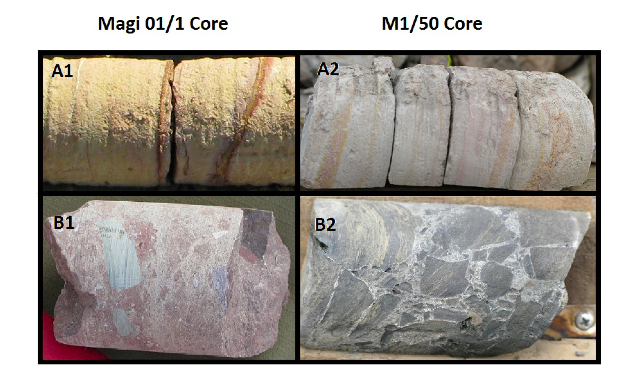 The photos below compare the various kimberlite crater facies sediments (A1, A2) and RVK breccias (B1, B2) from Pangolin’s core drill hole Magi-01/1 (to the left) versus those from drill hole M1/50 from the M1 Kimberlite Pipe (to the right). The Tsabong North Project is situated on the Archaean Kaapvaal Craton, immediately north of the diamondiferous Tsabong kimberlite field that hosts the M1 Kimberlite, the largest known diamondiferous kimberlite pipe in the world (www.firestonediamonds.com). Pangolin’s Chairman, Dr. Leon Daniels, was part of the Falconbridge Team that developed the geological model of the 180 hectare M1 Kimberlite that was discovered in 1978. He was also directly involved in the discovery of several new kimberlites in the Tsabong kimberlite field. Pangolin’s soil sampling has produced highly anomalous concentrations of kimberlite indicators within the Tsabong North Project area. Microprobe analyses of indicator minerals have confirmed the presence of G10 garnets, indicating the presence of a mantle conducive to the crystallization of diamonds. A number of indicators occur, including remnants of kelyphite that indicate close proximity to kimberlite. Enzyme-leach trace element results are consistent with orientation trace element results over known kimberlites near the Project. Pangolin Diamonds Corp. is building a leading diamond exploration and development company in the heart of Botswana, the world’s leading diamond producing country by value. The Company is the 100% owner of 11 Prospecting Licenses covering 5,307 km2, including the Tsabong North, Jwaneng South, Malatswae and Mmadinare Projects. Pangolin’s management and team leaders have over 90 years of combined diamond exploration experience in southern Africa. This makes the Company the most experienced diamond explorer in Botswana other than De Beers Exploration and Debswana. The Company is equipped for exploration, with two diamond drill rigs and a fully portable one-tonne per hour Dense Media Separation Plant used to prepare samples and make diamond concentrates. Pangolin is well-funded to continue its exploration programs for the next year.